Bloggers Unite! How Blogging Has Enhanced my Life in China – Writer. Traveler. Tea Drinker. Bloggers Unite! Life Behind the Wall and Writer. Traveler. Tea Drinker, together at last! Last Saturday night found me surrounded by women from ages 20-mid-40’s. Mostly from America, mostly old China hands, mostly into Chinese guys (either married to or interested in), mostly African-American. We had come from different places in China, a few even traveling for 5 hours by high speed train to celebrate a birthday. We ate dinner at a Korean place and then partied 80’s style, with neon clothes and 99 luft ballons. It was the first time I had met them, and yet we chatted like old friends and I walked away a few sisters richer. So how did I get an invite to this group? Thanks to my blog. The reason for the party, and the group in general is Jo Gan, blogger behind the award-winning Life Behind the Wall. Several years back, through our blogs, Jo and I started a kinda blogger friendship. When she moved to Hangzhou we chatted on Weixin. I helped her with a project for MTV (which my friend Jason had a small bit) and we talked, always promising to meet up. Then she added me to another weixin group of other women in China (in different parts) and we have been chatting on a regular basis for months. Most of the time it’s just fun stuff, but we’ve helped each other through sickness, divorce, guy dramas and celebrated pending nuptials, new relationship and new babies. But I had never met them. Until this week. It was Jo’s *ahem* 21st birthday, and Jo doesn’t do anything small. It was the perfect excuse for almost all of us to get together for the weekend. Because I have to work on Saturdays I could only join them for dinner and the party, but I was so happy to finally be able to put names to faces, and voices to the texting we had been doing. Jo was decked out in 80’s neon glory. And they were such an awesome group. Foreigners tend to be young or old, as most people try out china right after school, or after they retire. But in this group I was one of the younger ones but they were mostly from my generation, and it was awesome to be around people who knew my childhood pop culture references and could sing Prince not because of some retro admiration, but because they danced to it in the 80’s like me. A lot of them had grown kids (Jo has grandkids) so they had this maturity to them but at the same time had this total freedom and nonchalance about life. This is a very rare demographic in China. To be around this group of kind, supportive, fun-as-hell women was just what the doctor ordered. And it is all thanks to blogging. Of course blogging helps me in many ways: it gives me an outlet for my thoughts, a place to share my experience with others, a chance to do writing that other people read. But actually it has done a lot more. Blogging has really enhanced my time in China and even my understanding. I’m just one person, with my own thoughts and experience, but through blogging I learn about so much more. When I went to Taiwan I got to spend the night with Niel (from Confused Laowai) and his girlfriend in Taipei, and someday when I go to Guangzhou I’ll hopefully meet Sara (from Living a Dream in China) and her new husband. And if Jocelyn (from Speaking of China) ever leaves her small village I’m hoping to meet her too. Me and Niel sipping fancy people drinks together in Taipei. But even if I don’t meet them face-to-face, we have struck up a digital friendship and we encourage each other. We’ve written on each others facebook, leave blog comments, and even have a Facebook group to pass info and ask each other for help. It’s awesome. And I’ve made a lot of friends with non-bloggers as well. People who have read my blog and contacted me. I’ve made a lot of chinese friends not just in the country but outside as well. 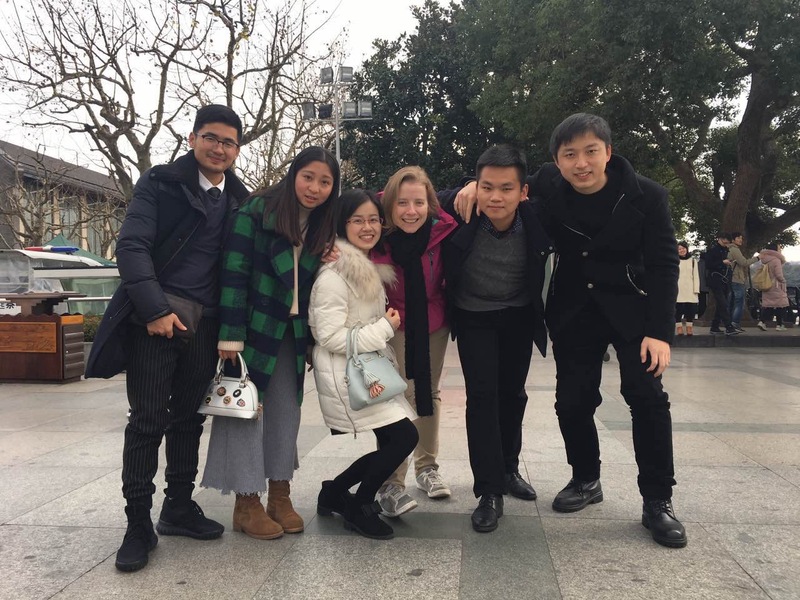 We might never meet, but just talking to them and getting to know them makes me understand China, and Chinese people in a way that I couldn’t otherwise. I know some people who are reading this right now are in China, and have been thinking for a long time they have wanted to start a blog, but just “never got around to it.” Well, I want to encourage you to do it! There are a lot of added, offline, benefits to doing it. And I think the more voices that are heard the better. There is a lot of misunderstanding between the East and West, and people who are in the middle of these two cultures, like us expats, can add a tiny bit of understanding that might slowly add up to a waterfalls worth. Blog on, my friends! Hey Becky, thanks for mentioning me in this blog, I’m touched! I look forward to meeting you sometime as well! Maybe one day we can organise a gathering of bloggers and readers, there seems to be quite a few living in China . What a great gathering that would be. Yes I know it can be done; look at the two of you your minds are already working at the idea. But I think many bloggers and readers would love to meet each other just because we all have the same thing in common. We all live in China. There are many females living not so far for one another e.g. Shanghai, Hangzhou, Suzhou, even those living a little further away there are means to get to places, fast trains. I think it will take a few dedicated people to come together and organise it and then put it out…just like Jo did with her birthday party. I’m sure they’ll come. If we are serious about it , then it can be done!